Preserve your investment with a regular car valet. It’s simple, it’s easy and it makes a lot of sense. After using our services, we are confident that you will be impressed by the quality of the finish. After all, your car is probably your second largest purchase after your home, so a small regular investment in care and attention can pay dividends. You can choose between a weekly, fortnightly or monthly car valeting service depending on your requirements. 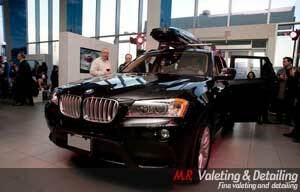 With M.R Valeting you know it’s in the hands of a trustworthy company that genuinely cares about your car. This is not just about having your car washed, it is about protecting your vehicle, and your investment. The value of a car in good condition can be considerably greater than a similar vehicle in poor condition. It, therefore, pays to take care of it. Regular treatment with our high-quality products will protect your car with a tough defensive barrier, helping to deflect dirt and dust and lessen the effects of UV rays and other environmental damage. By keeping your vehicle clean, contaminants are less able to adhere to its surfaces and therefore less likely to have harmful long term effects. Regular car valeting works very simply – the initial valet, which we recommend to be our Platinum or Platinum + valet, is at the standard price appropriate to the vehicle size and condition. Subsequent valets are discounted according to frequency and will maintain your vehicle to the same high standard. Based on your car usage, budget and undoubtedly busy lifestyle we will agree with you an optimum frequency for valeting your vehicle. Following the first car valet, all subsequent valets will be undertaken at the agreed interval. No contracts or paperwork to sign. No advance payments are required; you pay the pre-agreed price upon satisfactory completion of each valet. As with all our services, payment may be made by cash or cheque. Savings of up to 20% over our already competitive prices. No contracts or paperwork to sign. No advance payments are required; you pay the pre-agreed price upon satisfactory completion of each valet. As with all our services, payment may be made by cash or cheque. Your vehicle is professionally cleaned and protected on a regular basis, thereby maintaining and preserving its resale value. Call us today for a quotation to have your car returned and maintained to showroom condition.